Originally, reported on redcrosschat.org, there is just one day left to bid on an auction a Michigan fan who is trying to find a new team for his allegiance. So, he’s auctioning off his allegiance to the highest bidder and helping the Red Cross and donating 80% of the profits to the Disaster Relief Fund. 1. Why did you decide to auction off your Michigan allegiance? I have been an avid University of Michigan fan for my entire life. In 2001, my employer moved my to Northeast Ohio. Since then, Michigan has been pitiful, and the Buckeye fans are really good at constantly reminding me of it. In fact, I would say that Buckeye fans in Northeast Ohio are a quite aggressive bunch! After I put some thought into it, I figured this auction would be a fun way of raising some funds for the American Red Cross – as well as helping me stay sane in the heart of Buckeye country. 2. Which school do you hope wins your affections? I just hope it isn’t Ohio State. 3. Why did you decide to donate the proceeds from this auction to the Disaster Relief Fund? I work with our local Red Cross representative, helping to organize the blood drives at my place of employment. I greatly respect the Red Cross and their focus on saving lives. 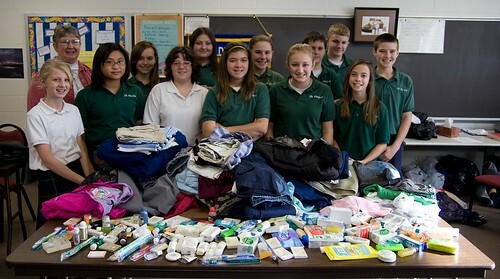 I don’t think people realize the impact the American Red Cross when it comes to helping those in need. 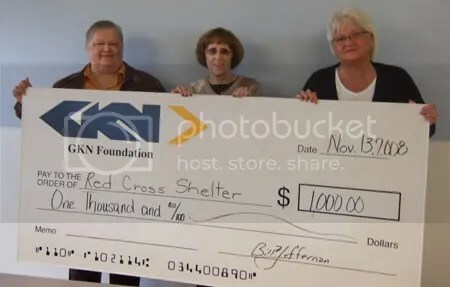 The Red Cross was a perfect fit, and I was fortunate that they have partnered with eBay. It was an easy choice. So, if you’re looking for something to buy on Cyber Monday you can help the Red Cross and a frustrated Michigan fan choose a new team to cheer on – bid now! 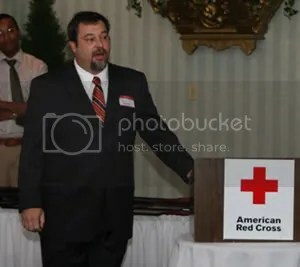 Need a Red Cross speaker at your event or luncheon? Volunteer Tony Gasparini speaks at a donor appreciation event. Are you having an event coming up and need a speaker in the Rock River Region? Would you like to learn more about the Red Cross and how we help the community? All you need to do is to contact us and we’ll be there to speak about the Red Cross and answer any questions you may have. It’s just that simple!